In the middle of the summer we had a chance to participate in an expedition with the aim to locate a missing WWII P-38 aircraft from famous Lost Squadron. Full story was covered by lot of news and publications, so we will not duplicate it here, you can follow links below. Here we would like to share our experience of using drones in Greenland. It was not too cold in the middle of Greenland’s summer even on the ice cap. Our camp was deployed at an altitude of around 700m above sea level, and often it was quite warm during daytime (except 3 days out of the 8 when we had a snow storm :-)) and below freezing during the “night”. During daytime the temperature was warm enough so that it was sufficient to wear thermal underwear and a membrane of second layer. I think that the temperature was close to +10-15 Celsius. At night (when sun was close to the horizon level but not quite below it) ice formed on the floors of our tents and we had to wear 3 layers including gloves, balaclavas etc. Next time we will use something like Peli cases with integrated electrical heaters and good internal insulation to quickly warm up the batteries before start and to keep them warm - but this year we had to fly with a constant “Battery temperature is low” warnings. It was nice to be able to check the temperature of each battery in software (of course we used UgCS for this), so before take-off we checked that the temperature of each battery was +5 Celsius at least. If somebody knows where to order/buy such cases for M600 batteries please let us know. It is not rocket science to DIY them, but I’d rather purchase ready-made ones. Except for the batteries we didn’t have any problems with drones caused by low temperature. Before we were taken by helicopter to the ice cap from Kulusuk, almost all our heavy equipment (including drones, GPR etc) were delivered by boat to some point on the shore close to the Lost Squadron site - to minimize cost of helicopter flights. Here the equipment was left in boxes on shoreline under polar bear supervision for 4 long days :). But after delivery to site and 2 days of snow storm (it started in couple of hours after landing and everything was buried under snow) everything worked well after unpacking/charging and some warming under the bright Arctic sun. It is an even more serious problem then low temperature. On the ice cap light was coming from all directions - you feel as if you were inside a mirrored chamber together with 1000 Lm of light. Outside nothing is visible on the screens - even when the sun is masked by clouds. The only comfortable place to work with laptops was inside of our “main” tent, but it requires close and constant coordination between ground station operator sitting inside the tent and the drone pilot outside. Now we are working on a lot of modifications to the UI of UgCS - we will use much larger fonts and more contrast in the theme everywhere. Critical messages will be displayed over the entire screen and it will not be possible to miss them. For us it was 120km ‘till the nearest WiFi hotspot which was reachable only by helicopter :-). Next time we will check everything 3 times before leaving the comforts of civilization. We thought that we had prepared everything. We checked and double-checked our DJIs to prevent any surprises, downloaded maps and elevation data for offline use in UgCS (we used ArcticDEM elevation data – https://www.pgc.umn.edu/data/arcticdem/ ). But the problem struck us from an unexpected direction. 18 batteries for DJI M600 were taken from our office in Riga and they were tested and used before the expedition in test flights. Jim Salazar took another 24 batteries from his home in US, half of them were brand new. When we tried to use them on ice cap we got message about old firmware in batteries. F#$%^!!! Is it really so important to block flights in that case???? We used this small bird to film what we doing here and as cheap scouting drone to check the safety of routes before sending a multi-$$$ system (M600 with GPR) far off into the fog. To get useful data from the GPR, the maximum altitude from the ground can be 10 meters, but the lower you can go the more accurate the data will be. We tried to use an AGL altitude of 3 meters and used terrain following routes generated by UgCS using ArcticDEM elevation data. But we didn’t have full confidence about the precision of DEM data so when we planned to fly far routes we decided to use Phantom 4 to test whether it was possible to fly generated routes without colliding with the surface of the glacier. The collision detection sensors and algorithms of DJI Phantom 4 are not only useless in such conditions (where everything is white and you have fog everywhere) but can also cause a lot of problems. In an automatic mission it can decide that it sees obstacle and stop. In case of any problem with the radio link you can lose your drone easily. From my observations false potential collision detections can be caused even by very light fog/clouds - when drone itself was clearly visible. We recommend disabling all collision detection sensors before flying in such conditions and relying on your eyes, brains and piloting skills. When we first detected an anomaly under the ice (it was on the first survey line of very first flight!) we decided to make an additional survey of the suspected area using cross-grid with close distance between survey lines and low altitude – 3 m AGL. When we started these flights it was almost nighttime and the weather was calm, but the temperature started to get colder and colder with every passing minute. As a result katabatic wind began – and it got stronger and stronger as the temperature continued dropping. It was not very strong and without any gusts, so conditions in general were quite safe for flights. In theory, as the temperature is going down during the flight, the drone should fly higher and higher. But in our flights it descended more and more on each survey line – and finally we stopped the mission to prevent the drone from colliding with the surface of the glacier. My thought is that it was because of Bernoulli's principle – air pressure in wind should be lower. So the drone made attempts to compensate its virtual ascending. Not sure if I’m right or not. Special thanks to Air Baltic, Iceland Air and Air Iceland Connect– they allowed us to transport 18 LiPo batteries in hand luggage. All airport staff now knows about LiPo batteries – so don’t try to transport batteries without a special permission. Hopefully it is possible to get special permission from air companies to do this. We had to use a hard box (similar to Pelican), all batteries should be isolated from each other, and have permission on paper with us (we printed the e-mail from the airline). Special thanks to Jim Salazar and Ken McBride – expedition co-organizers. It was a really cool endeavor and an unforgettable experience what is almost impossible to get anywhere else. Safe flights and keep your bodies in warm places! In Greenland, the magnetic declination is about -30 degrees. Did u face any issues with navigation? We did calibration of compasses in Kulusuk - 120 km from Lost Squadron site. When we did first test flight on site, we didn't see any anomalies. Thank you for this fascinating story! Wow, what a great story. So you found the WWII bomber on your first line of first flight? You must have been jumping for joy. I'm a geophysicist and would love to know what GPR unit you used, can you please post a link, thanks. We used Radarteam Cobra Plug-In GPR (http://www.radarteam.se/index.html) together with our data logger/integration computer on board of the drone. If you wish to see collected data please PM me. Thanks for a great story! I loved it! I will allow myself to link to this story on my newsletter (https://weeklyrobotics.com/), hope you don't mind! Looking forward to new posts from you and the UgCS team! 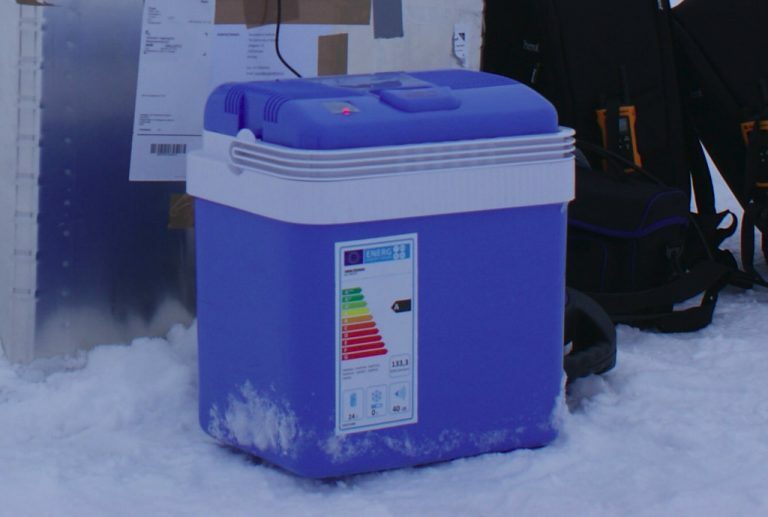 We use a camping cooler/heater to heat and store our batteries. Thank you Martin, will order and test.